We had the pleasure of meeting Tom and Grant Dalgliesh at Gencon 2016 this year. 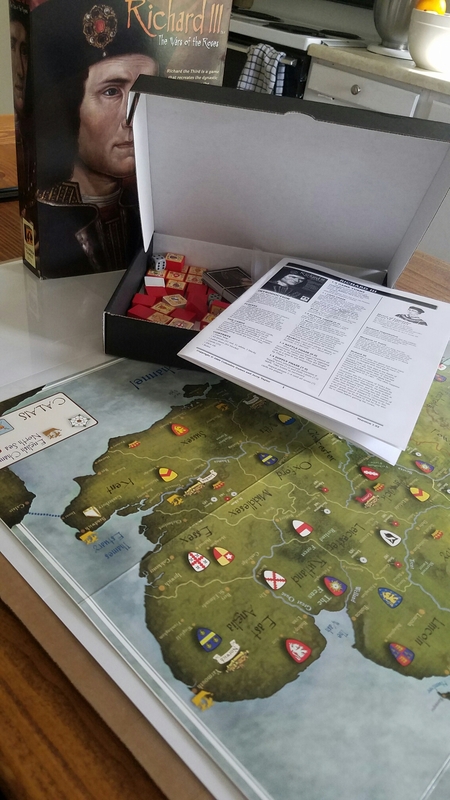 I have to admit that I hadn’t really heard of Columbia Games before this encounter, but it turned out that I did know some of their games; Hammer of the Scots, and Rommel in the Desert. I’ve never previously played any block style war games, although between myself and Grant we’ve looked into a few. When I saw the guys from Columbia were setting up Richard III for display I was immediately drawn to it. There was something about those big bright chunky blocks being setup on the map of my homeland that made me just stop and introduce ourselves, and enquire more about the game.. The Wars of the Roses was a conflict that engulfed the entirety of England during the 1400’s as the houses of York and Lancaster vied for power and ultimately the Throne. The bloody conflict lasted for three decades and was finally decided when Richard III was slain on the fields of Bosworth by the triumphant Lancastrians. Henry was crowned the VII and the two war torn houses were united by marriage. 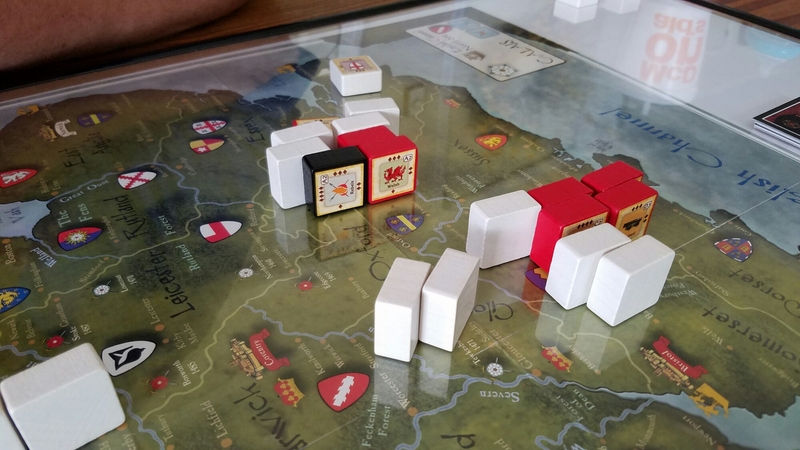 This block wargame from Columbia Games covers the conflict over 3 scenarios, each lasting only about 30-45 mins tops, so you’re able to play either just one scenario that’s short, fresh and can be bashed out quickly, or play the protracted campaign across all 3 scenarios in about 90-120 mins, which for a wargame is a real sweet spot as many wargames tend to weigh in at 3+ hours [for me at least]. Fog of war.. what are the enemy units? The game play in this one is actually very straight forward. It’s a CDG, but really the cards aren’t extremely complex, most of them just have a single action point allowance on them, there are a few special events, but those are very self explanatory. You use your AP’s to recruit new blocks in open or friendly areas, or to move groups from county to county, and really that’s about it. Movement is restricted by the colour of the county boundary, so sometimes you have to do a bit of maneuvering and staging in order to get the battles that you’d like, but mostly you just move one or two spaces. Combat is a series of die rolls that determine hits and you reduce block strength much like other games. The ‘fog of war’ from not seeing the values of blocks until combat is something I’m a big fan of, because it keeps the game on a knife edge from a decision stand point. You might find that four blocks look scary to attack, but it turns out many of them are reduced or weaker units. Then you face the dilemma of having over committed and ask yourself could I have split my armies more effectively? All of which makes for an excellent game. The artwork in this game is fantastic, the various house shields and the map itself look great. The block stickers are easy to read, and once again have those gorgeous looking family emblems on them. My only downer is the deck of cards, because they’re a funky in between kind of size and aren’t rounded so they feel a little under produced. These are also the only component where they seem quite bland, if you want to see more of what every thing looks like you can watch a video. The map is card stock instead of paper, so that’s a step up from many war games. The mechanics in this one aren’t anything particularly new or innovative, but they work. And that’s the most important part. 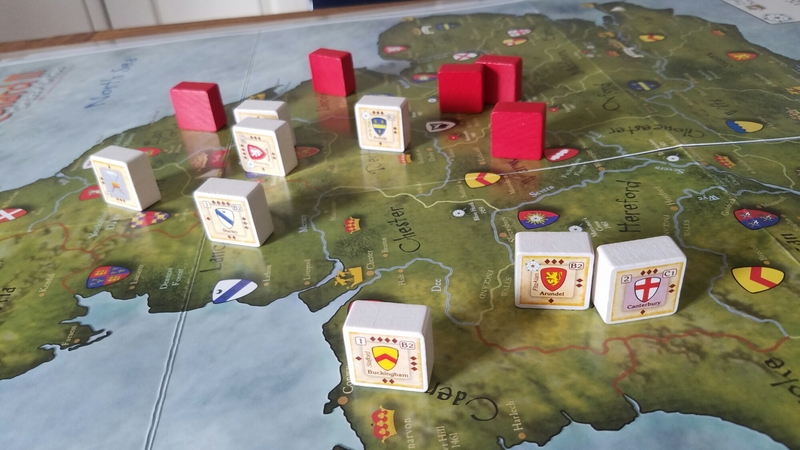 The movement restrictions caused from the borders is very interesting, and there’s sea movement which means nothing is ever ‘safe’ [my loss in our last game was sealed by the Irish conscripts sailing into my rear guard and killing two of my nobles]. The combat is very clean, and there’s often extremely tight decisions to be made about whom to assign hits to when there’s a tie to whom you can assign them. Do I assign them to a weaker unit that hasn’t attacked yet, or to a stronger unit that has, in the hope that they’ll make it to the next round and be able to attack again. Once again, this game is great, because the mechanics are simple, streamlined and facilitate good strategy. One of my favourite parts of this game is the traitor mechanic, certain units and cards can attempt to incite defection in other units during combat, which can wildly swing particular situations. It doesn’t come up often, so it doesn’t wreck the game, but it definitely makes you think twice when going up against Warwick! Your objectives in this game are simple. 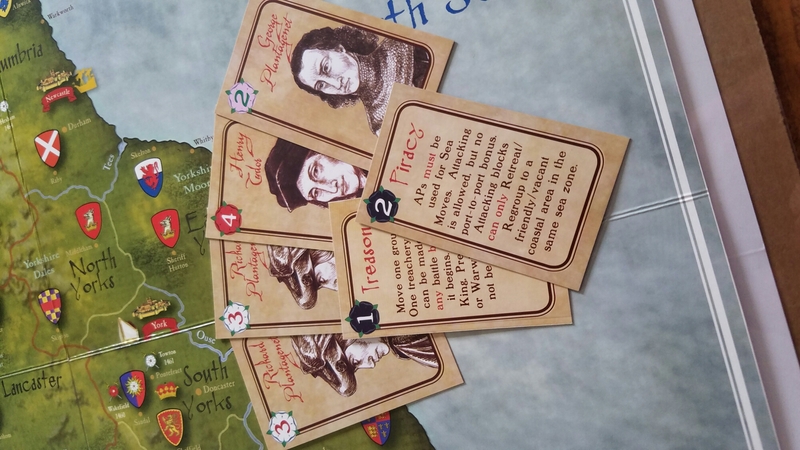 Have more nobles [as well as ecclesiastical influence and the possession of London] during the usurpation phase at the end of the game to take the throne and win! How you do that is up to you. We’ve found that you want to recruit as many pieces as you can from your pool and then try to decipher which enemy pieces are nobles and go for them. But how you go about doing that is utterly up to you. I feel like in this one there’s enough actions to do what you want, but usually you’ll find that the short number of rounds [seven] really means that you have to make everything count. If you get bogged down then you’ll not have time to advance across the map and do the combats that really count. All in all an excellent game in the strategic front. Richard III loses half a point in this category only because there are only 3 official scenarios in the book. I say that but there’s really only one, the other two you have to look up online, which I thought was a little odd. Having said that, because of the open nature of this game, as well as the fog of war, you can get a lot of plays out of this one before getting anywhere near tired of it. It also doesn’t hurt that the game is easy on the eye. And frankly, even if you had played the official set ups to death, you could just randomize the placement of the pieces a little bit and it would indelibly change the scenario and give you a fresh challenge every time. I’m not worried about ever getting bored of this one, I’ve got a lifetimes worth of game in this box. I cannot state emphatically enough how refreshing it is to play this game. The aesthetic is great, I also love the period and setting – I’ve never played another war game from this period. The time of play is a huge plus. I get to play a war game in no more than 45mins. Grant and I bashed out a game of this and played two other games in one session, which just feels so good. I get the feeling and brain stimulation of a war game, but I haven’t burned a whole night doing it. So Kudos to Columbia Games for making that happen. The nuances and little mini stories and subplots that happen in this game are just something else. In our last game the battle of York was vital to the outcome of the game, but then so was the ‘potato gambit of 1470’. All in all this game is just tops. You can pick it up from their website here, and check out many of their other games, which we’ll being doing in the near future too! This looks very similar to a game I had 30 years ago called Wars of the Roses. Wonder if it is the same? I’m not sure, but can ask the designer directly through the Columbia games website, they’re busy but always respond! Yes, I am pretty sure it is – just changed the name when Richard III got in the news,perhaps?